GLM offers an extensive line of pistons for all major brands and models of outboard engines. GLM pistons, like OEM pistons, are cast as opposed to forged. We have all heard the advantages of forged pistons. However, when you consider the disadvantages of forged pistons it becomes very clear why GLM cast pistons are the ultimate pistons for your rebuilding and repair projects. The major disadvantages to forged pistons are actually a result of the forging process itself. Forging results in a piston that is considerably heavier, than cast pistons, and is limited in the aluminum alloys that can be used to produce the piston. Additionally, the forging process also limits the design configuration of the piston itself. The forging process and its limited choice of aluminum alloys result in a dramatically higher expansion rate for the forged piston. This means that the set up characteristics are very different from the original engine manufacturers' and that break-in and warm up periods are crucial for the forged piston. An example of the dramatic expansion of forged pistons is the piston skirt clearances in the cylinder. 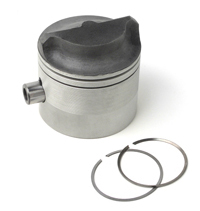 A typical forged piston has a skirt clearance of approximately .0007 to .0009. A cast piston has a skirt clearance of .005 to .007. The forged piston has 10 times more slop in the cylinder. This results in less ring stability against the cylinderical wall, more piston noise and extra blowby. In all fairness, after the forged piston has reached operating temperature, its dramatic expansion makes up for these extra clearances. However, this should remind us of the typical customer that a dealer services. Can we expect the casual weekend boater to strictly observe the extended break in period and the critical warm up procedures required for a forged piston? Let your own experience answer this question. Most forged pistons are quality products, but they are better suited to racing and professional applications.